With the announcement of one of it's top-of-the-line HD web cameras, Logitech delivered the best wide-angle webcam for MacOS in it's history. The Logitech C930e HD Webcam . It's wide 90 degree FOV - Field Of View makes it easier for more than one person to fit into the video frame during a group conference call or video recording sessions. It was the successor to the very popular C920 HD webcam and raises the bar a notch further in the premium web camera marketplace. Most other webcams offer a slightly narrower FOV, typically from 60-78 degrees. The FOV of webcams has generally increased over time. Logitech's most recent camera, the Brio 4K Ultra HD webcam has a native 90 degree Field Of View, but is changeable via software to 65 or 78 degrees if you prefer. This chart of Creative Labs webcams shows how narrow or wide-angle their various models have been over the years. The real question for those buying a Mac compatible wide angle web camera will be if they really want the C930e's wider 90 degree wide angle perspective that the web camera delivers. This might be ideal for security and surveillance monitoring or group video conferencing. But for the majority of Mac users doing 1:1 Face To Face interactions, wide angle web cameras might include far more of your surroundings and background space than you really want. 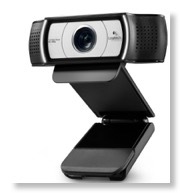 The C930 HD Webcam has a W-I-D-E-angle 90 degree field of view. Most webcams for Mac offer a narrower 60-70 degree FOV - Field Of View. With wide-angle cams, some distortion typical of a ‘Fish Eye Lens’ can occur. Logitech’s C930e claims to address and compensate for this issue to maintain a more accurate view of a business conferencing room or a couch full of friends or family at home. Do note however, that some folks may not like this trend towards the ever-wider wide-angle conferencing webcams. For more casual personal and adult 1 on 1 video chat, capturing more of what’s around or behind you in the room isn’t necessarily ideal, nor preferred. Hi-Speed USB 2.0 certified and SuperSpeed USB 3.0 ready connectivity. Full HD 1080p video calling (up to 1920 x 1080 pixels) and 720p HD video calling (up to 1280 x 720 pixels) -- Much of this depending on the CPU horsepower and internet bandwidth available on your Mac as well as the OSX video capture and conferencing applications you use. This Apple compatible HD camera supports hardware-based H.264 and SVC video compression, which part of the updated UVC 1.5 webcam specification. Realtime hardware compression reduces data sizes for smaller video files on your hard drive, and also addresses optimizations for negotiating the best video call performance and frame rates in single or multiparty HD conferences. This is an important advancement since the bandwidth available and packet delivery rates on internet cable, DSL, T1 and other network connections can vary between users in, and during a video conference. Bandwidth negotiation and monitoring during video chat is getting more sophisticated. Like the C910 and C920 cams which preceded it, the C930 features built-in dual stereo microphones as well. Dual microphone arrays can help with noise cancellation as well as deliver a more accurate aural presence to the room. In my testing with other dual-mic webcams -- yes, they really are stereo, but given how close they are in physical proximity don’t expect breathtaking ambient 2-channel audio. The 930e HD cam features super-smooth autofocus and their RightLight 2 automatic low-light correction technology that helps insure a clear image and better frame-rates in various lighting environments, even in low light. From my experience Logitech’s smooth and responsive autofocus took huge strides forward a few years back when they introduced the Mac Vision Pro. Far too many other Mac compatible web cameras have a rather ‘STEPPY’ and lagged auto focus. That can be distracting as a lesser webcam struggles to keep up and adjust to movement within the frame. Not so with the C930. As with their previous premium webcam models, Logitech continues to use the awesome optical quality glass Carl Zeiss lenses for spectacular image clarity few other Mac compatible webcam brands deliver. A small, flip-down external privacy shutter that snaps on to the Logitech 930e Mac compatible webcam is included with the camera. However, I think an optional piece of clip-on plastic a rather chintzy ‘security solution.’ Other webcam manufacturers have used more elegant and integrated sliding lens covers built-in to the camera over the years with no separate pieces to break off or lose. Also welcomed is a standard camera tripod mount. It's integrated into the universal clip that also fits various Mac laptops, LCD screens, or sits atop CRT monitors on your desktop. Many Apple users are frustrated by the limited angles and range of, say, a MacBook, iMac or Cinema Display’s built-in iSight camera. So there’s a very healthy demand not just for external webcams for Mac in general - but some really want the stability and precision placement a tripod mount webcam can provide.